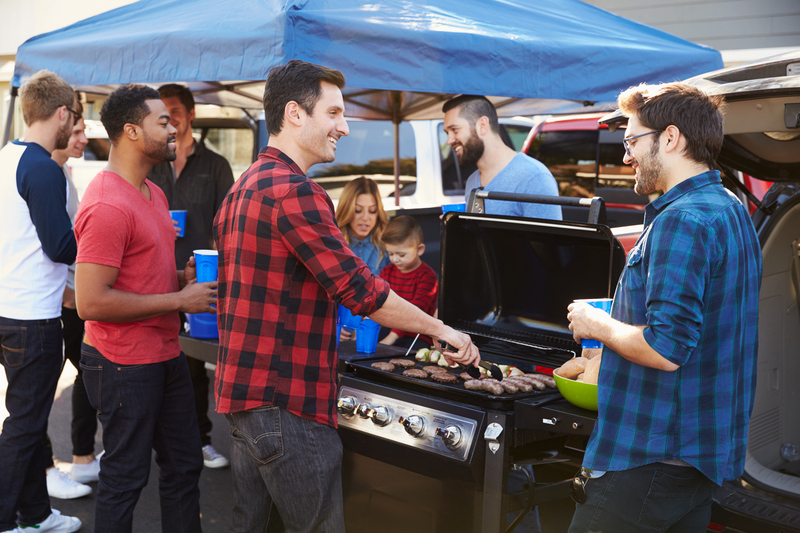 Position your grill at a distance from your vehicle or other vehicles; then, be sure to keep kids and pets at a safe distance from the grill. Always keep a fire extinguisher and a first aid kit on hand. If you’re going to be grilling meat or bringing other perishable food, make sure you have a game plan. Store food (and leftover food) in a quality cooler with plenty of ice. If possible, store coolers out of the sun. This will help avoid spoilage and food poisoning. Drink plenty of water to avoid dehydration – especially if you are consuming alcohol. Monitor the amount of alcohol you consume and stay aware of your surroundings. Don’t drink and drive! If you plan on drinking, make sure you have a designated driver. Make sure you properly dispose of your trash – especially glass. Leftover bottles in parking lots can puncture your tires. Stay alert and use caution when leaving the game. Before leaving, check the area surrounding your vehicle for broken glass, lawn chairs, or other remnants from the tailgate. Parking lots are often crowded, so drive carefully and watch for other people – especially children.